Which means trying to fit in too many projects, throwing out crap, donating other stuff, purgepurgepurge, and removing the damage that East Wash and a backyard train continuously wreaks on our abode. The new kitchen is amazing! 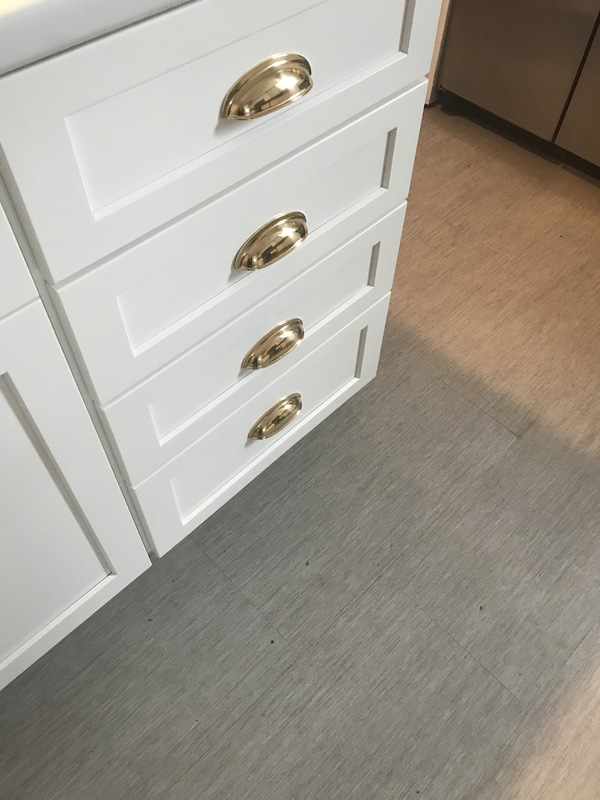 Shaker cabinets with brass pulls?! Thank you very much! And white subway tile with gray grout?! Yowee. Lately, I’ve spent so much time in a state of utter stress and terror. I’m scared about national affairs and changes at work have created a new normal that’s lead to a lot of tension and feelings of fragility and confusion. What I really need to do is concentrate more on the home front and the things that I can control. I know I’ve spoken and written and thought these words a million times over, but it’s really, really, REALLY time to put them into action and try not to obsess over all of the noise. I’m not saying that I could ever stop caring about politics or my job and just go through the motions or tune out, but I need to get WAY better about being able to separate them from the most important things in my life – my family and friends and my own well-being – or I’m not going to have anything left for those most important parts. And that would really be a shame. For me. Because, let’s face it, I’m not going to be able to make any of the changes that I really want to make in the world if I don’t take care of those most important parts first. And, if I’m honest, the real changes or the real effects I want to realize are about those parts. I want to be a good mom, wife, daughter, friend, niece, cousin and Madisonian before I want to be anything else. I want to advocate for my loves first, and then I’ll have the energy and confidence to take on something else. And that baby step over the past week took the form of a new front door. And it could not have made me happier. You see, our front door was a problem from the get-go. While it was an unoffensive, and even probably somewhat charming, red, it was totally ill-suited to the house. I’ll show you. You see the problem now, right? Oy. It’s got this weird, pseudo-prairie-style stained glass thing going on. What the hell is this door doing on my house? It. Drove. Me. Bananas. For. Years. Three, to be exact. Actually, it’ll probably drive me crazy in my dreams for a lot longer than that. Anyway, we finally bit the bullet and hit Home Depot to order a new door. This was a mistake because of a number of reasons, but we learned again that HD is great for many things, and is a mistake to do business with for numerous other things. Anyway, we ended up canceling their delivery service and using one of our favorite local handyman service folks and we saved hundreds of bucks. And then we got this sweet gem. Holy bananas. What a palpable change, amirite?!? Sorry about the ThredUp bag in all the shots. More on that someday, if you want. Now, we had to paint it. And you know me, I couldn’t wait a second, so I got going right away. Door went in Monday morning, the first coat went on on Monday night. Oh, a word on the paint. We had originally picked Sherwin Williams’ Electric Lime for the paint, but the paint gurus at Sherwin Williams nixed it, telling us that it would fade in the sun on our north-facing exterior door. Rats! But we appreciated the advice, of course. This is why I love going to the professionals at the paint store. Anyway, we quickly moved on to Exuberant Pink, which we had also used in the kitchen (and it’s still there, but now it just barely peeks out above the subway tile around the window – I think it’s a fun pop and I like how it plays off of the front door, which it sits directly behind). It’s taking about seven hundred coats to get it on there properly, but we love it. And then the finally piece went on this morning . . . A knocker I bought a year ago, I think. And I’ve just been waiting for a new door to put it on. So, I know it’s a small thing. It’s just a new door in the world. But to me, it’s long-awaited vision, now realized. And it’s a door that just makes me so happy. The toaster oven is here, but I can’t tell you about it because all I’m thinking about is tile. 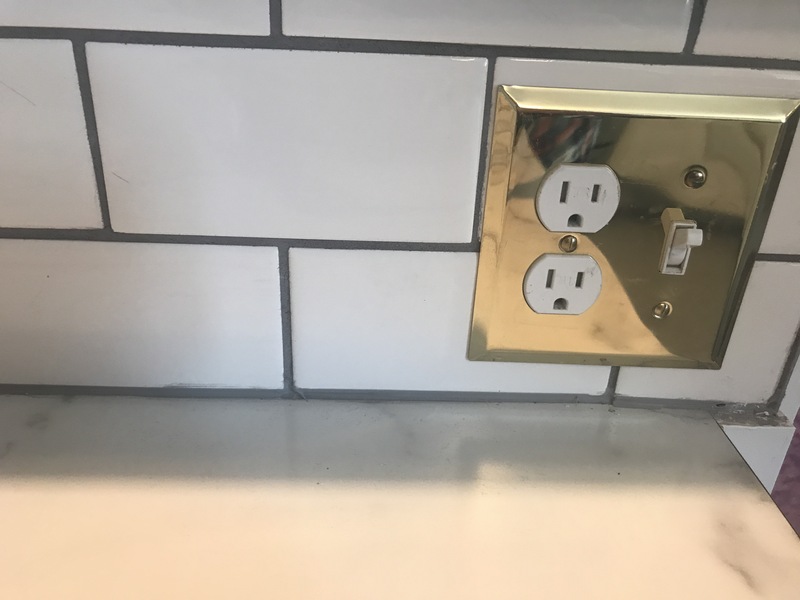 Backsplash tile. Oops. No, I’m also thinking about grout. Gotta go. I’m sure there’s a blog I’ve missed that has the solution to my tile dilemmas.